Red Rangler is our sorrel link at the Itsy Bitsy Burro Company. We are extremely pleased with his development. He has a nice straight back, well-rounded hindquarters, nice chest, and exceptional legs. 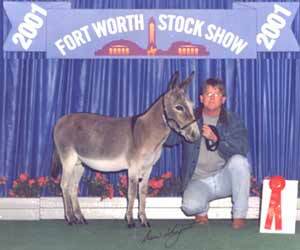 Rangler began his show career fall 2000 by winning Model Donkey at the Texas A&M Donkey and Mule Show. 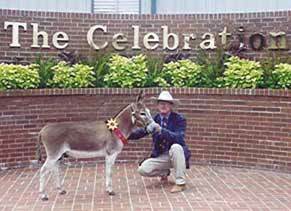 In June 2001, Rangler won Model Donkey in Corsicana, Texas. In Shelbyville, Tennessee at the 2001 National NMDA Show, Rangler was Reserve Grand Champion Jack. His exceptional confirmation, loving personality, and 32" size make a winning combination. 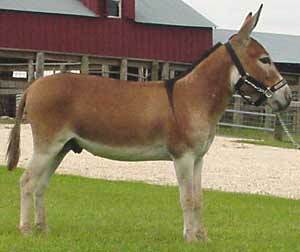 He is the only sorrel jack that has repeatedly won in the show ring. Tomcat, Rangler's son, won the yearling class in Corsicana in April 2002 and has been sold to England. Rangler has sired sorrel and black to select jennets.